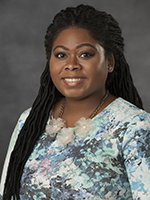 Jonsette Calloway joined VCU as the public relations specialist for Parking and Transportation in 2015, and later transitioned to the University Public Affairs team in 2017. She currently handles outreach communications, marketing and event planning for VCU Parking and Transportation. Prior to joining VCU, she worked as a copywriter at Johnson, Inc., a marketing and communications agency in Richmond, Virginia, where she helped create engaging content for communications campaigns for clients across radio, print and online mediums. She has also served as a copywriter for Bank of America where she composed and audited communications on behalf of the Office of the CEO and President and responded to requests from governmental agencies. Calloway graduated from Howard University with a bachelor's degree in advertising/English in 2009. She earned her master's degree in integrated marketing communications from West Virginia University in 2012.